Hi Friends!! Yesterday I was brainstorming on another project and came up with this. I’m mindful that I’m running out of time to show Christmas things so . . . I was trying to think of something different to do, and this is what came up. I was happy with it and I have to say it looks better in real life. I recently received the Spellbinders Heirloom Ornament because this month Our Daily Bread Designs released a design that fits inside the ornament. The other ladies in the design team produced some stunning creations from A to Z with that die template – it left me scratching my head for what I could do that they hadn’t already done, lol! Here you can see the entire project. The ornament embellished with crystals, bow and a tag to match! Thanks all for stopping in to see me today! See you soon!! Oh my…this is so GORGEOUS!!! Love the idea!! Wow, Becca, how gorgeous! Love the ornament and the tag as well. so very very elegant…. just amazing…. and I agree, definitely a tutorial in your future…lol…. Oh My Becca you have done it again!! Absolutely gorgeous!!!! You have such talent Becca! Thanks so much for sharing it with us! A Christmas feast for the eyes! Beautiful lines and colours. But of course, you’ve spoiled us so we’ve come to expect the best from you. And… you never disappoint. So pretty! 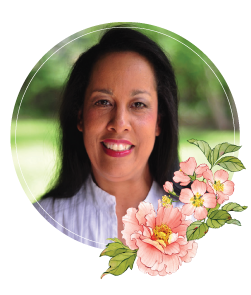 I love the PP you used and the ribbon with the dainty gold trim. The crystals are the perfect finishing touch! Another stunning project. I do hope there will be a tutorial for those of us who would love to try our hand at recreating it. What a treat to see when I came home from church! and I have not opened it yet..Hope there is a little time this week to play! Oh yeah, you’re gonna have to show us how to do this! I love this ornament, it is so stunning. I ordered the die in November and it has not arrived yet. I will probably come right after Christmas (smile). However this is beautiful. It gives me thoughts for other punches and dies that I have. Thanks for sharing. This is so pretty Becca. I snatched this die set up as soon as they came out with it. I just knew that this was going to be a fabulous set for Christmas. Obviously I was not alone, because countless stamp companies have designed around this set. 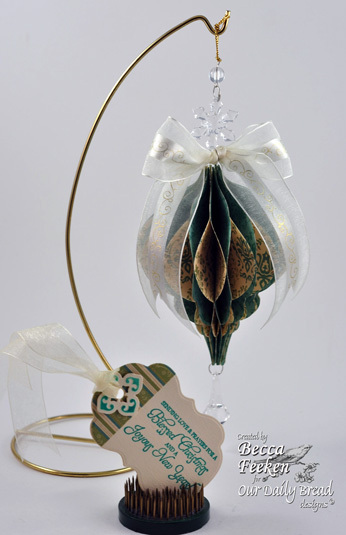 I have also seen tons of ornaments that have been made using it, but none as gorgeous as this one. Leave it to you to think up yet another masterpiece. This really is gorgeous and those chrystals add so much. I am so glad that you are back in the game. I have missed that creative mind of yours. I am just sorry that you had to go thru so much this year. You are definitely a trooper. Happy Holidays Becca. I sincerely don’t know how it can be prettier in person because it sure is outstanding in the picture. Fantastic as per usual and I do like the non-traditional colors once in a while. One of your great tutorials would be appreciated. This ornament is fantastic. 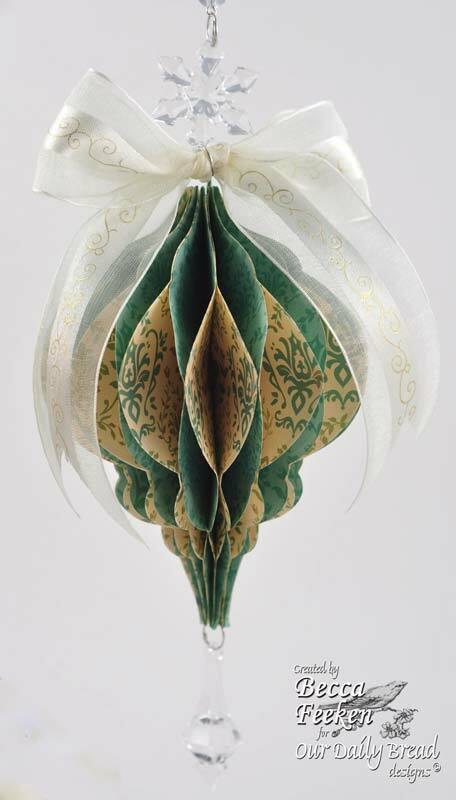 I would love the directions on how to make it because I would love to make them for my tree next year. Oh what a beautiful ornament! 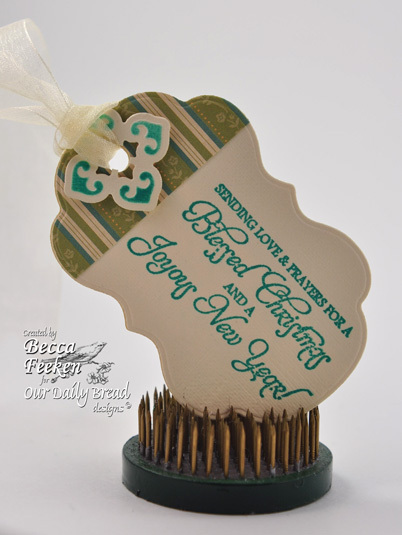 The addition of the beads and the matching tag make this a beautiful gift, Becca! WOW, you are for sure amazing and you create amazing jewels everytime. Yes, I agree a tutorial would be the icing on the cake after your busy holidays. I will be thinking of you this season without the love of your life. COULD BRAINSTORM AND COME UP WITH AN ORNAMENT LIKE THIS. YOU STILL HAVE PRAYERS COMING YOUR WAY. Becca, you have done it again……that deco is stunning!!!!! This is so beautiful. Now I really want the die. I would love a tutorial on this some time…I love it. WOW!!! Becca you sure do have a way with paper. OH MY GOODNESS, this is just beautiful Becca!!!! You will receive alot of emails on how to make this one!!! its stunningly gorgeous … please can we have a tut for this fabulous project. Becca – you never cease to amaze! That is stunning! I love it! You never cease to amaze me with your talent. Stunning – hmm…..I think that word has been used frequently in the comments for this design, Becca! A very clever design. I love this, Becca. Now I’m on a mission to find paper like it to do some….for next year, of course. Great idea. Fabulous, and I would be very pleased with a tutorial. What a wonderful idea! Could you please please please please please give us a tutorial on how to make it? Lovely beyond words. Wonderful gift idea. Looking forward to your posting the tutorial. I know you will as soon as you have time because you are always so good to us. WOW – I need this heirloom ornament die – you show it off magnificently here – your attention to detail as stunning as usual. Love the ornament & tag. Love the colors, stamps, beads, paper, ribbon. Do I see a ornament tutorial in the works? When my webpage opened up I said OMG how beautiful. This is so stunning and I love the colors. So Victorian looking! You did a super job but then you always do! Please let us know how you made it! Thanks! Very beautiful Becca. Another awesome idea for me to put away for later. Can you tell us who is the manufacturer or what craft store you got the snowflake crystal from? or is it a Christmas garland that you took apart perhaps? Yup – you still got it girl! Love the ornament! Amazing! Gorgeous! Wish you were here…. oh wait…. I should be there. This is just gorgeous!!! I hope there will be a tutorial soon. Becca there is nothing I can say that hasn’t already been said. You continue to have such beautiful ideas. Thank you for sharing with all of us. Can’t wait for the tutorial! I think my favourite things that you have done is the heartcornerpunched circle, the laced woven frame and this ornament. YOU ARE FANTASTIC!!! My mind was with you in your difficult time and we ALL are lucky that you still have the mojo for crafting so you can inspire us even more. I agree with Teresa ~ our thoughts and prayers are still with you through this very hard time. Hope the crafting is your therapy! Absolutely gorgeous ornament! I hope a tutorial is coming soon! I hand make ornaments for my kid’s teachers, and would love to add this to my list, but can’t figure out how you did this. You are an inspiration to all of us! God bless you and yours at this Holiday time and always! Christmas gifts. I hope you will do a tutorial on this, not sure I could figure out how it was put together. I love the tag, but WOW WEEEEEEEEEEEE that ornament is totally AWESOME!!! Oh Becca, PLEASE post a tutorial if you have time, this is beautiful, i just recieved my die and would love to make this Christmas Eve with my daughter, to give to my mom on Christmas Morning. Please post a tutorial of how you created this if you have time. 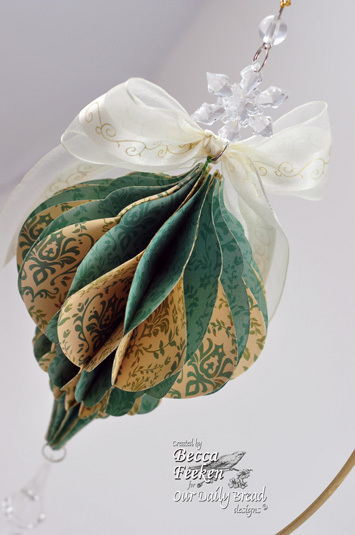 It reminds me of the tissue paper decorations we had when I was little, only this is much more sophisticated and elegant. Becca this is stunning..I love when you do projects like this as your so talented in doing them.. I absolutely LOVE your ornament! I’m staring at it trying to figure out how you did it. I really hope you find time to do a tutorial – that would be soooo awesome! get the top and bottom rings on? We are all banging on the table and say this all at the same time, “Tutorial! Tutorial! Tutorial!